If a tornado watch is in effect when the late news is on and thunderstorms are forecast for your location I recommend a tone-alert weather radio or one of the new smartphone apps that will alert you if a tornado warning is issued for your location (keep the phone near your bed). A study by Walker Ashley and others (Ashley et al. 2008) examined tornadoes from 1950 to 2005 and found that 27.3% of all tornadoes across the nation were nocturnal, while 39.3% of tornado fatalities occurred at night. In this study, nocturnal or nighttime tornadoes were defined as tornadoes with start times in local standard time that occur between the local sunset and sunrise. During the 55 year period, tornadoes were nearly 2.5 times as likely to kill during the overnight hours as those during the daytime. Even more alarming, the study found that North Carolina was ranked first with the greatest percentage of killer nocturnal tornadoes. They noted that 81% of all tornado deaths in North Carolina during this period occurred at night while only 28% of all tornadoes in North Carolina during this period actually occurred at night. While this specifically applies to North Carolina, the basic principle applies everywhere. It is dangerous for tornadoes to sneak up in the middle of the night. Tornadoes are possible tonight in southern Missouri and Arkansas. ADDITION: Via Facebook, reader Bob Kerr reminds us of the November 6, 2005, tornado in Evansville, IN that touched down at 1:50am and killed 23. Thanks, Bob. 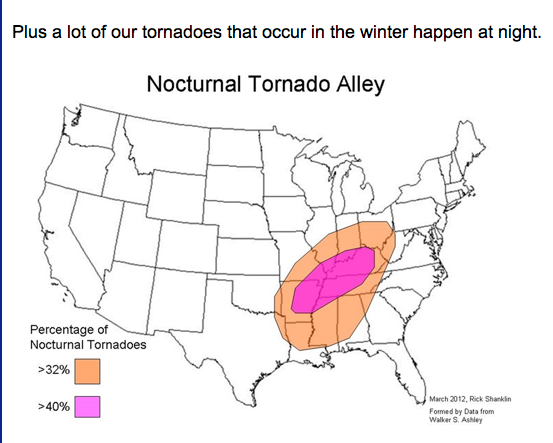 Bob also directed me to this information from the NWS in Paducah, KY. I wasn't aware there was a "Nocturnal [overnight] Tornado Alley."